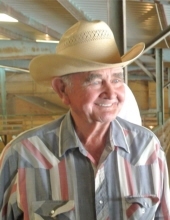 Jerome Hodnefield, age 83 of Garden City, Iowa,passed away on Thursday, April 11, 2019 at Rolling Green Village in Nevada, Iowa. Jerome Orlen Hodnefield was born on January 10, 1936 in his maternal grandparent’s home south of Radlciffe, Iowa. He was the eldest of three children born to Joseph and Orva (Knutson) Hodnefield. He grew up on a farm south of Garden City, Iowa. He received his education by attending his first six years in McCallsburg and the last six years in Radcliffe, where he graduated in 1953. He was seventeen when he started farming on his own trying to help his widowed mother. Jerome loved to roller skate and that’s where he met Sharon Kothenbeutel. They were married September 16, 1961 at the Elim Lutheran Church in Marshalltown, Iowa. They continued to farm their entire working lives. Jerome also co-operated C & H Auction Company with Alvin Clark. Jerome also raised and sold horses, Collies and Border Collies. They continued to live on the farm where he spent his entire life until moving to Zearing in 2016. Jerome was a life long member of Zion Lutheran Church. He passed away Thursday, April 11, 2019 at Rolling Green Village in Nevada, Iowa. He is survived by his son Joel Hodnefield and his wife Rie; two granddaughters Kaylee and Emma Hodnefield; one sister JoAnn Omvig of Lexington, Kentucky. He was preceded in death by his parents, his wife Sharon, daughter Jolene, son Jason and brother David Hodnefield. To send flowers or a remembrance gift to the family of Jerome Orlen Hodnefield, please visit our Tribute Store. "Email Address" would like to share the life celebration of Jerome Orlen Hodnefield. Click on the "link" to go to share a favorite memory or leave a condolence message for the family.